Better off out than in? Would you be happy for other people to know that you were feeling vulnerable? Or that you were feeling angry, or hungry or tired? I have been reading up on wearable technologies lately, and one of the things that strikes me is that of many people a big deal for other people to know just how we’re feeling. It’s an issue of privacy. Many wearables rely on interpreting, almost in real-time, physiological changes which indicate that a person is experiencing a particular emotion. My hope is that people would use a variety of different tools to help inform their choice of Care Label at any particular point. This could include tools like mood-tracker MoodScope, or any of the other types of applications experimented with by people involved in the Quantified Self movement. Depending on how much data you wish to collect about yourself you could track your nutrition, exercise, sleep, mood, heart-rate, blood pressure – whatever you believe can help inform you about what your needs are at any given moment. You could adjust your Care Labels as often or as rarely as you wished, and, importantly, take them off if you really feel that they will really give away too much about you. 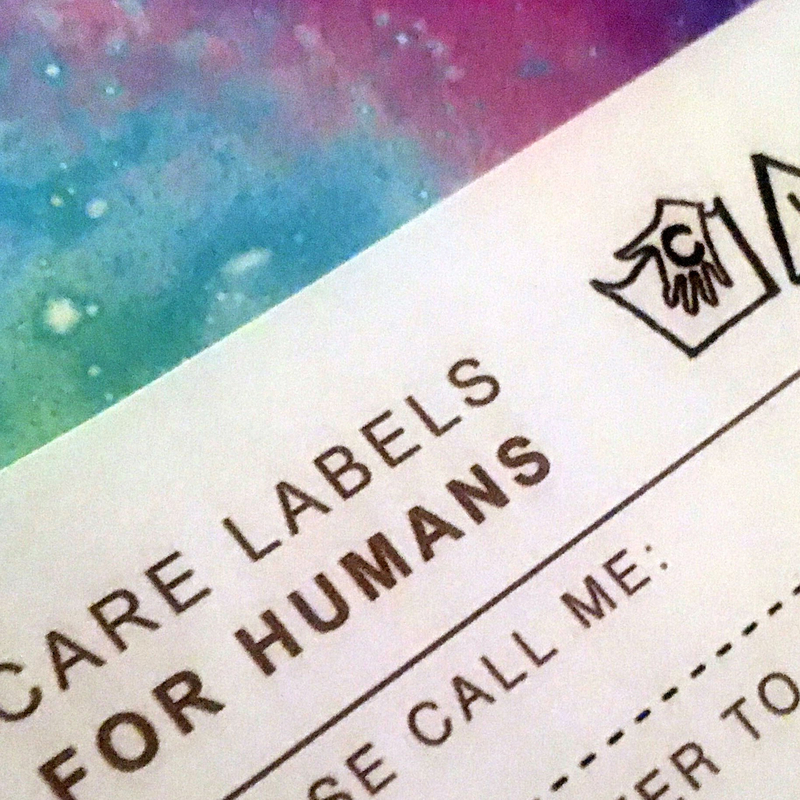 How happy would you be to wear Care Labels? Are there any Care Labels that you would not want other people to see you wearing? You can find a list of suggested Care Labels here – please add your thoughts in Comments below. Comment: what is compassion focused therapy? Pictures on my whiteboard that bring me daily cheer. I mentioned recently in comments that I’d been studying something called compassion focused therapy (CFT) for the past year. This type of therapy was devised by Professor Paul Gilbert who is based in the UK. It aims to harness the power of developing compassion towards ourselves and other people in order to develop a healthier balance of feelings and behaviours. You may have heard of cognitive behavioural therapy (CBT), a practice which encourages people to challenge difficult thoughts. The theory is that by changing damaging behaviour we can change our thoughts to more positive ones, which in turn promotes healthier behaviour – completing a ‘virtuous circle’. The NHS has invested a lot in CBT as there is a lot of medical evidence to support just how effective it can be in managing common psychological problems. You can read more about this kind of therapy on the NHS Choices website. CBT is known to help with conditions like anxiety, depression, post-traumatic stress disorder (PTSD) and eating disorders. However, it doesn’t work for every person with these diagnoses. The reason might be that, for some people, difficult emotions are so deeply ingrained with problematic thoughts or behaviours that CBT is not as effective. This is where compassion focused therapy comes in. CFT is based on a different kind of model which is the interplay of three basic psychological systems. Each system can affect the other and there is a constant interplay between the three systems. Threat – the way we respond to people or events that we find troubling – traditionally explained as ‘fight or flight’ responses. Drive – this reflects our motivation to act, at a basic level we need our drive to take care of ourselves and any dependents. Soothing – developing self-compassion is a powerful tool in helping people to comfort themselves when times are hard. This is just a general outline of compassion focused therapy. You can get a fuller picture of how CFT works on the Compassionate Mind website. The approach also incorporated mindfulness practices which help to ground the body and mind. These might include breathing exercises as well as developing a greater aware of the moment that we are in. I believe that CFT has a lot to offer people who have experienced psychological distress, but developing self-compassion and compassion for others can benefit anybody. If this is something that interested in I strongly suggest that you refer to the websites I have highlighted in this piece. Note: Do we need watches to tell us more than the time? My watch is not a smart watch, but looks pretty cool with its built-in calculator. 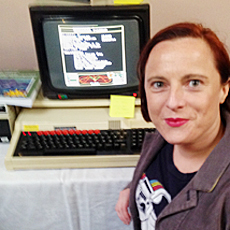 BBC News Technology journalist and Click presenter Alex Hudson has been somewhat prolific of late. I know this because I have him in my Circles in Google+ – a space which I am still experimenting with. In Alex’s article, Do we need watches to tell us more than the time?, asks why smartwatches i.e. connected devices have not made it to the mainstream marketplace. He cites Knight Rider as the main cultural reference for children of the 1970s / 80s like me, in which tech-forward car Kit is controlled by David Hasselhoff speaking into a futuristic watch. This is not the case for me, as it was a commercial featuring one-time Doctor Who star Peter Davison and his showbiz wife Angie Dickinson trying to flog some saucepans with a ‘lifetime guarantee’. To date I have been unable to find a high quality clip of this advertisement, but here’s a slightly ropey one so you get the general idea. The upshot of Alex’s article is that tech is just not quite there for smartwatches. While the big players like Casio, Samsung and (possibly) Apple continue to tinker, smaller start-ups like Pebble are getting in the act by crowd-sourcing their projects. In imagining wearable ‘care labels’ I have focused on highly visible designs which could be worn, for example, as badges in the ‘Star Trek communicator’ style – read my first thoughts here and additional thoughts about a possible role in my project for mobile devices here. A wristwatch could be another location where care labels could be displayed. Possibly in a more discreet way, giving the wearer a greater amount of choice about who sees the labels and who doesn’t. In addition to this, one of the main advantages of smartwatches is considered to be near-field communication. It’s interesting to contemplate a world where not only could we communicate our daily care labels but pick up those of other people within range. I’d like to thank my good friend Phil Bradley for a few thought grenades he’s bunged in my general direction lately. Most recently he sent me YouTube video by a guy called Alex Day who has started a Tumblr site called Lifescouts. He loves badges and didn’t see why earning them for various challenges shouldn’t continue beyond the world of scouting. Alex has devised a series of enamel badges which can be earned for a range of activities listed on the Tumblr site. So not only can people wear and share their badges face-to-face but add notes on their experience of each achievement to the Tumblr site. You can see a full list of all the badges released to date here. What has this got to do with ‘Cheer up love’? Well, it’s about sparking face-to-face conversations around personal experiences by using a wearable item that might tell you something about that person you didn’t already know. Wearing symbols, whether they reflect your achievements (Lifescouts) or your needs (Cheer up love care labels), acts as an invitation to other people to connect with you – even if they’ve never done so before. The physical, wearable object says ‘I am open to having a discussion about this’. What would care labels say about a you? So I had a really interesting conversation with brilliant graphic designer Angie Chan at the weekend (thanks for your time and thoughts @angieokchan). Her comments provoked me to consider in more depth what purpose wearing care labels might serve. And, importantly, how the information on the care labels would be received and understood by others even if they had no prior knowledge of the concept. Communicating a specific need without stating a difficult emotions explicitly. An object to spark a conversation about the symbols and what they mean. Taking a moment to adjust the care labels each day and connect with their emotions. But how would other people, those unaware of the project, respond to the care labels? Recognise the symbol and act as the wearer intended. Notice the care labels and ask why they were being worn. Recognise the symbol and choose not to act on it. Not notice the care labels at all. Thinking about this helps me to understand the purpose of the care labels. Primarily this is to create a connection between two people where one person (the wearer) struggles to express their emotions. A secondary advantage is cause of self-reflection when setting care labels which allows the wearer to ‘check in with how they feel’. I suppose the point I am making here is that the care labels have intrinsic value, in and of themselves, regardless of whether or not they elicit a response from another person.